Guitarist and songwriter Andy Rock is perhaps best known for his work with the Greek melodic hard rock band Wild Rose which he founded in 2004. The band has released four studio albums since 2011. A prolific composer Rock cut his first solo album, Into The Night in 2012, and now returns with a follow up, This Time. I suspect if your stage name includes "Rock" in it, you should probably live up to your name. 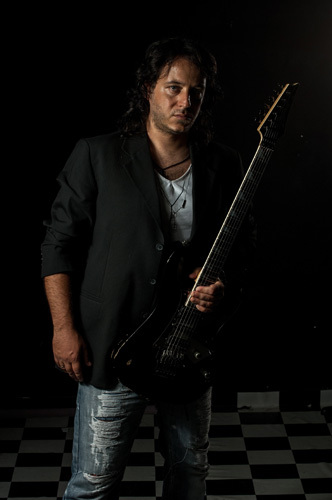 Citing general Eighties influences yet also, more specifically, artists such as Michael Bolton, Chicago, Journey, and Richard Marx, Andy Rock plays essentially AOR melodic rock. All the songs are high on melody and harmony, largely from the guitars and vocals. The vocals are provided by former Wild Rose vocalist David Saylor, who has melodic raspiness to his voice. Additional backing vocals come from Lions Pride label exec Chris Silmoa. Groove from a solid rhythm section add a toe-tapping vibe to each song. Additionally, Rock adds some color and embellishment with light and lively snyths. Being foremost a guitarist the songs ultimately veer towards a fiesty guitar solo in the latter third of each arrangement. It probably isn't quite fair to call this album a "guitar-centered" album simply because rock writes well-rounded and well-balanced songs that include all participants. As for the songs, most are simply straigh up melodic rock tunes, long on AOR accessibility and lighter on a hard rock or metal edge, with Give Me A Reason, This Time and Once In A Lifetime stand outs. The closest thing to ballad comes with Don't Say Goodbye, but even that has a steady rock groove. Rock provides a instrumental segue with Dreams, featuring a strong guitar solo over synths. Fundamentally, Andy Rock's This Time is well-crafted and enjoyable Eighties style AOR melodic rock, and so exactly what he was aiming for and what he does best. Recommended. 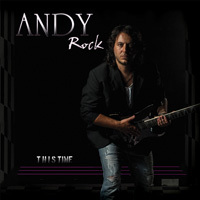 Andy Rock's This Time is well-crafted and enjoyable Eighties style AOR melodic rock, and therefore exactly what he was aiming for and what he does best. Recommended.